Beer brewing equipment, wooden structure and acrylic paint, dimensions variable. 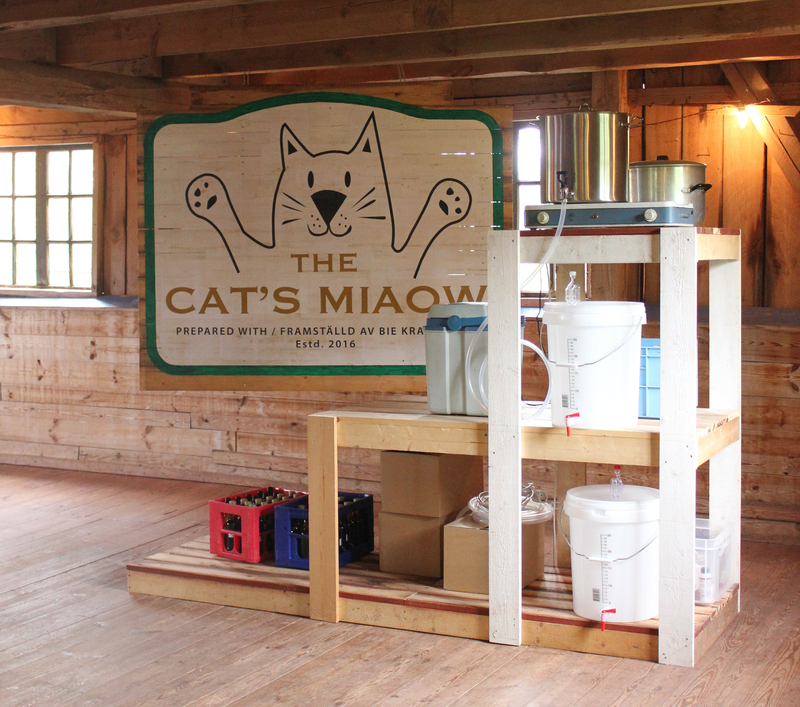 For the Bie Biennale Allen proposed brewing a special beer named “The Cat’s Miaow”. The idea was apparently based on a curious bottle label the artist came across while making a visit to the exhibition organisers’s home. BIE ANANAS (BIE PINEAPPLE), the label proclaimed below an illustration of a grand fountain topped by a toga’d Poseidon character and his trident. Aside Poseidon were two magnificent water spouting fishlike creatures but below him, sitting in what may be a cereal bowl, was a cheeky cat holding its paws aloft. The label goes on to tell us that the contents of the bottle for which the label was intended were prepared with highly radioactive health water and produced at Bie Health Spa’s Mineral-water Plant. There is unfortunately no date. Allen intended to marry the mysterious label to a bottle with contents of his making – a beveridge with less of an unhealthy edge than highly radioactive water but still retaining a bit of a kick – a beer brewed in the barn from the fine water of Bie.